Notes: Okay, I draw the line at calling this a “substantial main course” as mentioned in the introduction to this article. It’s shrimp cocktail. It’s not a meal. On it’s own, it’s an appetizer; paired with bread and a salad, it’s maybe a meal. Rating: Not really a meal, but still very good. I love TJ’s cocktail sauce. You’ve got to be kidding me! Shrimp cocktail is a favorite dinner around here. 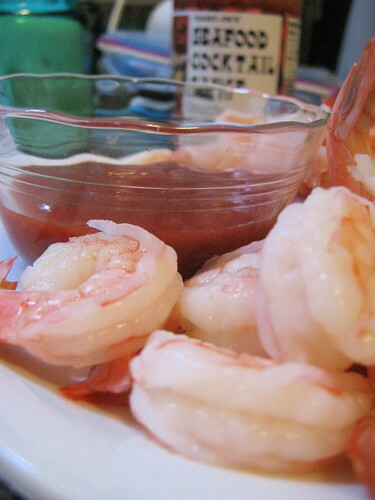 When we’ve had a tough day, or are too tired to cook, we make a quick shrimp cocktail. So much more satisfying than take-out. Ha! Well, I guess one (wo)man’s appetizer is another’s dinner. I agree, Kristen, this needs some help to be a meal. Maybe a can of cannellini, drained and tossed with a little olive oil, a little minced garlic and chopped basil. A nice foil to the tanginess of the cocktail sauce. Good to know about Trader Joe’s cocktail sauce, by the way. Pingback: StumbleUpon » Your page is now on StumbleUpon!